My regular readers might wonder why I decided to entitle this blog “Boiling frogs”. There are two reasons behind this. First of all, it is obviously an allusion to the frenchy perspective of this blog, and an attempt of autoderision :). The second reason is less funny though: it is related to my worst nightmare: the “boiling frog effect”. Some of you might know already what I am talking about. 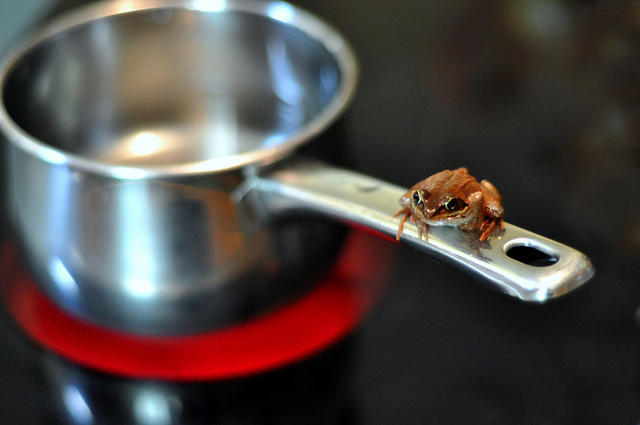 Boiling frog refers to a quite famous experiment in which you place a frog in a pan full of water, then slowly warm the water up until the water boils. What scientists observed is that instead of trying to escape a promised to death situation, the frog doesn’t try to escape the pan. It progressively get used to the water temperature, and eventually, the frog slowly die without any form of protest. The experiment has become a famous metaphor, which is quite relevant for today’s economic situation. Look at Japan for instance: it’s been 20 years that the country is suffering from a great stagnation, or a slow-motion recession, you choose. Like in Europe and in the US, the japanese government bailed out many banks in the 90s. The Bank of Japan has also been very active in keeping the bankin system afloat, like the Fed and the ECB are doing right now. Despite such activism, the japanese economy never saw any recovery so far, going instead into a long stagnation period often called the “Lost Decade“. In economic terms, economists define the japanese situation as a “liquidity trap”, a situation in which the central bank intervention doesn’t create not a single bit of stimulus in the economy, notably because its main interest rate are already at the floor (0,1% in the case of Japan). However, because the banks don’t anticipate any longer-term growth, they are not willing to lend in the real economy. As a result, there is indeed no recovery but a harsh debate about how to tackle the skyrocketing public debt (and a lot of frogs being boiled through purchase power losses and unemployment). In this regard, the debt crisis currently hitting Europe is nothing new: zombie banks, austerity and quantitative easing has been the japanese reality for twenty years now on. Of course, the situation in the eurozone right now is slightly different from the japanese one and the US. In the eurozone, the mandate of the ECB prevents it from supporting too much governments solvability, which explains in a large part why we have a euro crisis and not (officially) a crisis with the yen or the dollar. In this regard, the euro crisis is much more about politics disagreements than economics. While japanese and the american central banks are much more active in supporting the sovereign bonds markets, with quantitative easing plans and others shameless interventions, in Europe though, the ECB has been trying to avoid as much as possible to intervene in the markets. Sure the ECB eventually take action (Several times, the ECB reluctantly announced its implicit support to the economy despite of the European Treaty), but it does at the last time possible, and with the fewest extend possible. One have to understand this: whatever the ECB wants to do or not, when things go wrong, central bankers don’t have much choice: either they do not intervene and let the euro go bust, which is contradictory with its mission to ensure financial stability and survival of the euro ; either it does support the financial system with the risk of overriding its status or interfere with its political independence. Or course, Frankfort’s central bankers will always choose the second option, not only because it has less dramatic consequences, but also just because central bankers would probably not want to lose their jobs with the collapse of the euro, especially if they can personally avoid it. In this regard, the risk of a collapse of the eurozone might be actually way overrated. The problem of the eurozone is maybe much more political then purely monetary. Or more precisely, the euro crisis is due to a monetary failure that european politicians for some reasons, don’t want to fix. Eventually however, monetary policymakers might end up in ‘fixing’ it by themselves. Am I saying that the euro crisis could be solved very soon? Well, if you want to talk about the greek crisis, rising sovereign bonds rates, and other deposits flights, yes, this could be ended quite easily – if only the ECB act as a conventional central bank, buying back huge amounts of public debt and keep on regardlessly supporting the banking system. The system could perfectly keep going on if only we didn’t have a political disagreement inside the eurozone, and slightly different views on the role of our common central bank. However, don’t hope anything more than that. Unemployment will keep on rising, growth will keep stagnating, and inequalities would most likely increase as well. However, the tricky thing is that like the frogs in the pan, we need to reconsider how we regard and interprete the sensitive signals we receive in order to actually understand how bad is the situation we are trapped in. From my own experience, I can tell you that one need to unlearn a lot of pseudo “economic evidences” we have been fed with in order to think differently. For instance, we need to reconsider our views on what money is (or should be). We need to reconsider our dreams of full-employment and look at the harsh reality of all this humans lives wasted because of our pseudo moral argument that “everyone should be working”. Even better, we should most seriously wonder what is “activity”, “work”, what is “value”? And currently, who is doing or creating what ? Most of all, we need to ask ourselves: what is the economy if not a Human-based concept? If we find relevant answers to these existential questions, then maybe we can all wake up and escape the pan together. Otherwise, don’t expect anything else than a big nasty froggy porridge. Happy meal, folks.